The GAUNTLET develops tough, hard-nosed ball carriers. Running through the machine teaches explosion, body lean, second effort and ball security. The tunnel simulates a swarming gang of arm tacklers. A total of 12 or 16 spring-loaded arms are distributed over 4 rows. The top row is designed to strip the ball; bottom row to trip you up. Every step through the tunnel is met with resistance. Use the Gauntlet to improve tackling skills. Tackle a lightweight bag through the tunnel to make sustained leg drive a habit. 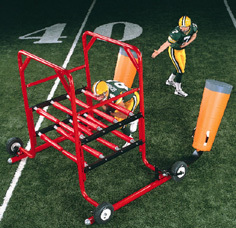 When ordered with optional add-on pads, the Gauntlet can double as a 2-Man Sled. 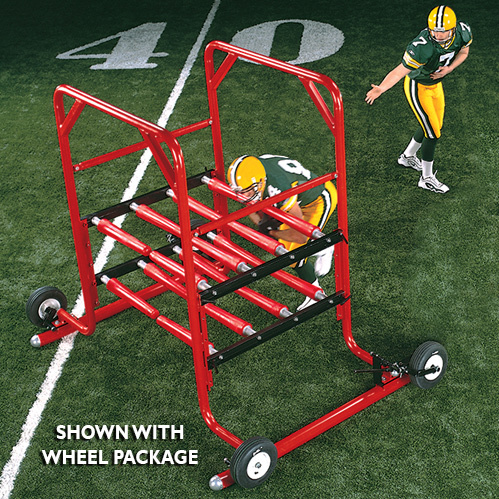 Optional Wheel Package makes the sled portable. Photo shown is Gauntlet with wheel package. "The coaching point is to accelerate into the hit and run through the arms of a tackler!" Four-Year Warranty on sled springs and frames. One-Year Warranty on pads and arms. Order Gilman Gauntlets from the football equipment industry leaders since 1929!